Fresh out of college, when you start your sparkling new job, you’ll be faced with the daunting task of signing up for benefits. It’s a little like being dropped off in a foreign country without a translator. You won’t understand most of it, but you can eventually navigate it. Hopefully, your somewhat-confusing benefits include a robust retirement plan, such as a 401(k) with a healthy employer match. If you’re like most bright-eyed college grads, you don’t really have a plan for retirement. Without any sense of urgency, you’ll sign up for the 401(k), contributing just enough to get the full employer match. You pat yourself on the back, and then spend several more years doing nothing more about your retirement. Then one day, something will change. Perhaps you get married, have a baby, or the stock market negatively impacts your 401(k). You’ll start to panic a little and wonder if your 401(k) is going to be enough for retirement. Contributing to a 401(k) is certainly a solid plan for your future, but is a 401(k) all you need for retirement? Your 401(k) is simply a tool, and it’s only as good as you make it. If you never contribute to it, then it will never be enough for retirement. You could theoretically take half your paycheck, stick it in a savings account (or under your bed), and be able to retire. But smart people know that money will grow faster when using the benefits of compounding interest. That’s what makes a 401(k) work. You contribute, your money earns interest, the interest is automatically reinvested, and your money grows. In order to maximize that growth cycle, you should contribute as much as you can, right? When Should You Consider Delaying Contributions? Some financial gurus do not necessarily recommend that you contribute to your nest egg right now – for example, if you have debt. In this situation, they argue you should only contribute enough to your 401(k) to get your employer’s match. For example, if your employer matches 100% of your 401(k) contribution up to 3% of your salary, then you would contribute 3%. A rarer stance is that you shouldn’t contribute to your 401(k) until you’re completely debt free. While that might give you a slightly bigger paycheck to slay debt, it’s effectively reducing your salary by 3%. Your employer is giving you 3% extra – never mind that it will grow through compounding interest. It’s wiser to at least take the employer match. On the other hand, we have covered before that personal finance is personal. Even if you have debt, you might decide to contribute aggressively toward your retirement. 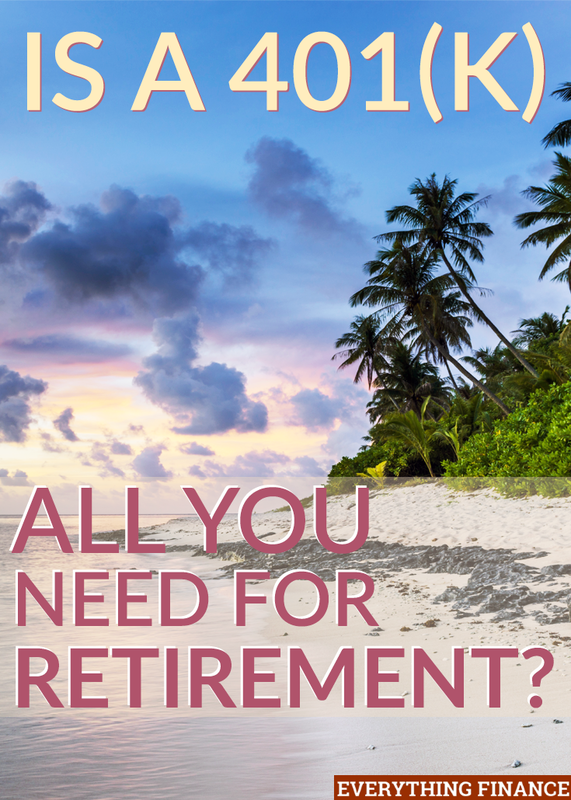 If you are able to put extra money toward paying off your debt and still set aside additional funds for retirement, then maybe the additional retirement contribution is the best plan. A trusted financial advisor can help you run through the financial scenarios to see if this makes sense, given your contribution rates and your time until retirement. No matter which path you choose, the real answer is this: contribute as soon as possible, given your complete financial situation, and maximize your contribution to see the biggest returns on investment. Now that we have established that you should contribute as much as you can, as soon as you can, to your 401(k), we need to explore whether your 401(k) is the only place your money should go. 1. The Internal Revenue Service (IRS) put a limit on how much an employee can contribute to their 401(k) each year. The limits change yearly and depend upon your current age. For 2016, the maximum 401(k) contribution is $18,000 if you are under 50 years old. If you are over 50 years old, you can contribute up to $24,000. Earlier, we covered how debt might affect your retirement contributions. If you were not able to contribute very much for several years, you will find yourself playing catch-up. If you are frantically saving everything you can for retirement, then the yearly caps could be a problem. 2. Your 401(k) contributions are pre-tax, but the disbursement is not. When you retire and start using your 401(k) to fund your golf adventures or your round-the-world trips, you will pay taxes on that money. This isn’t rocket science; there is nothing tricky about it. In order to prepare for a large tax bill after retirement, you simply save more up front. 3. Here’s another no-brainer: your 401(k) is not the most flexible investment. When you signed up for your 401(k) plan, your head was probably spinning with all the choices. You probably had to go through quizzes to test how risk averse you were and how much time you had to prepare for retirement. It probably seemed like you had too many plans to choose from, and it might have been difficult to pick one. In reality, when compared to all the possible investment options in the world, your 401(k) offerings are a drop in the bucket. Throwing all your retirement contributions into your 401(k) is a little like putting all your eggs in one basket. 4. Because you signed up to have the money come out of your paycheck each month, you might not be the most vigilant about where the money is actually going. First things first, be sure to check into the administrative fees associated with your plan. In some cases, they are quite hefty. Mutual funds might take 2% of your earnings, so be on the lookout for big hitters like those. Also beware that not all fees are disclosed – which could be your retirement plan’s undoing. 5. If you have plans for retiring early, you might not be able to totally rely on your 401(k) for your retirement. Your 401(k) is essentially sealed shut until you reach retirement age. If you want (or need) to access your money before that point, you’ll end up paying to access your money. If you attempt to withdraw from your 401(k) before age 59 1/2, you will not only pay taxes, you will also be assessed with a 10% early withdrawal penalty. Just because your 401(k) isn’t perfect doesn’t mean you should run far away from it, screaming with your hands up in the air. As with most things in life, there are pros and cons. Use your 401(k) in a way that maximizes the pros and minimizes the cons, and you’ll do fine. However, to ensure you are adequately prepared for retirement, you should look into additional investment options, such as IRAs. But you don’t have to limit yourself to that option – you can play the stock market or invest in farm land. After all, diversity is the key to investing. What about you – are you solely using a 401(k) to fund your retirement, or do you have other nest eggs? I certainly ended up relying too much on my 401K to retire early. I was 27 when I first heard about my company’s 401K plan in 1985. I took the route of contributing up to the match percentage and concentrated the rest on debt elimination. Once debt was gone I increased my savings percentage until I was hitting the yearly maximum. I thought that was enough. At age 40 I decided that I wanted to retire early and found out how wrong I was after finding a competent and trusted CFP. That was 1998 before there was the info we now have available online. Retired at age 51 and never looked back. Having Roth IRAs is important to round out retirement investments and provide options later on. I will say that my early days of only doing the company match when I was in my twenties definitely laid a great foundation for my portfolio as we all know time is our ally in investing. However I find that being debt free not only means having a less stressful lifestyle but allows some the option to quit the rat race since a low cost lifestyle means you need less in investments to support yourself.